If you missed the most recent sale on our brand new t-shirt line, I have great news! 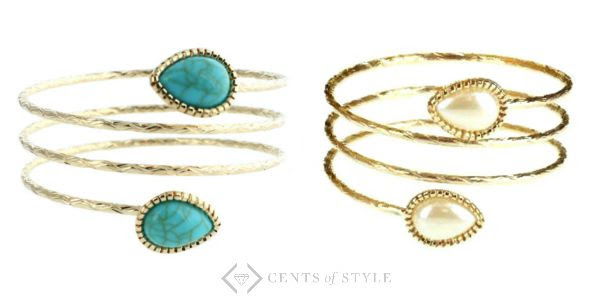 Because of its popularity, Cents of Style has made the sale available again! 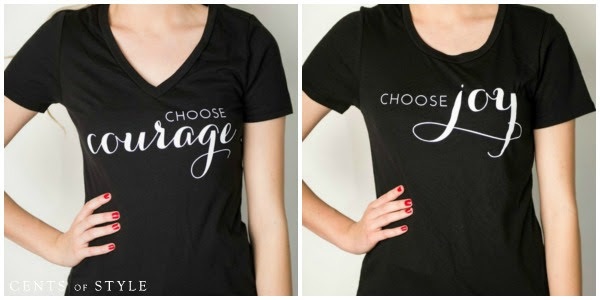 Get our Choose Series T-Shirts for just $14.95 shipped when you use coupon code MSMCHOOSE at checkout. 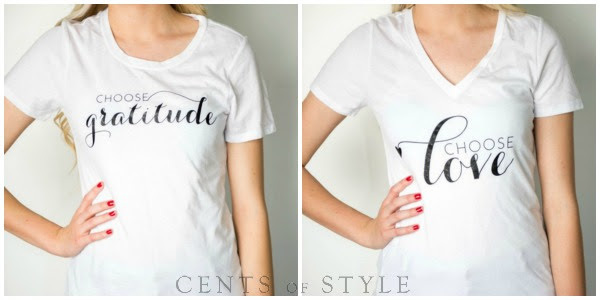 There are four different designs to pick from: Choose Gratitude, Choose Love, Choose Joy, and Choose Courage. Each of these phrases has had significant meaning and impact in my life and I’m excited to be able to have such a tangible reminder to wear and remind me to live with intention and purpose. Plus, they are super cute! Also, when you add a t-shirt to your cart, you’ll receive a free tear drop bracelet with your purchase ($9.95 value). Go here to get a t-shirt for yourself or a friend, and don’t forget to use coupon code MSMCHOOSE to get the sale price. Sale is valid through Monday, September 7, 2015. I purchased the two available in black because I sweat too much to wear white. 😉 I so hope this deal comes back around Christmas because I’d love to buy the white ones for my work’s Secret Santa. I’d purchase them now, but I don’t know whose name I will draw and, therefore, which size to get. My co-workers have gone bananas for the two I have and I know these shirts as gift would be a guaranteed hit! I purchased two last time in the crew neck. I have decided they just didn’t offer the #choosecourage in an XXL. The white #choosegratitde is too thin to wear without a cami. I love the #choosejoy one though. I don’t really like to buy clothes online as they never seem to fit right. However I love the silver bracelet is there anyway to just buy that? Just ordered the Choose Joy shirt! Can’t wait to get it! Where can I get that heart cardigan? Would love to see these in other color options – like gray or soft navy. As a dressing your truth type 2 – I’m moving away from white and black. They are super cute though! 🙂 I so hear you and we’d love to offer some different colors down the line. Thanks so much for the suggestion! Wearing the “Choose Gratitude” t-shirt right now! I just ordered “Choose Joy” – it was sold out in my size the last time you had this deal. Love these! Woot! Woot! That makes me so happy! How about some larger (plus) sizes? Thanks so much for that great suggestion! Yay! So glad that it fits you well! Love that they come in V neck. Crew neck is just not for me. Hope you are resting and feeling better. I missed it! It’s 1 am on Tuesday.? so bummed. Is it possible to have an extension of the sale or can you tell when it will come again?